There's a lot of items there, so I'm going to break it into two parts. Here is Part II (Part I here). 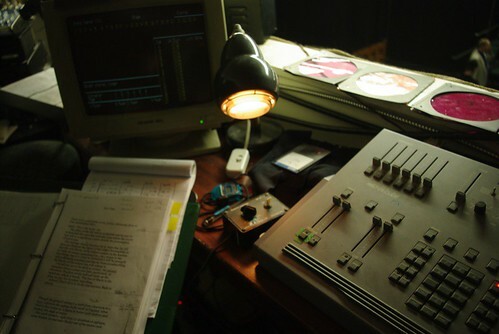 Made/Age: July 2012, 3 years old. Fit: It's just too big in the bust. I kept it around because I was pregnant at the time and though it would fit well later in the pregnancy, but it never did. Because it was that big. It looks okay in the photos, but I always felt like I was swimming in it. Style/Materials: Cookie Monster Blue Berrocco Vintage. Because it's a superwash wool/acrylic blend I couldn't even shrink it to fit. Construction: This sweater had it going wrong from the get go. I recalculated the yoke increases from the pattern, because as originally written it made the sleeve have weird "wings". It looked like a circular yoke construction, but all the increases were centered over the sleeves. I restarted the yoke again and finished the sweater, but I didn't have the heart to knit it again, when it was too big. Final Verdict: When in doubt, rip it out. Made/Age: July 2010, 5 years old. Fit: The fit is fine (I think), the truth is I just didn't wear it all that much. 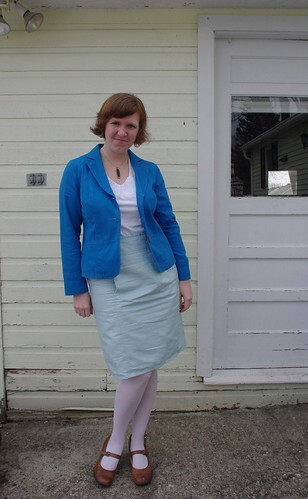 I have another rather similar blue sundress (that I got at the consignment store oddly enough), that I preferred to wear. I can't really pin down why, but this one just never seemed as flattering. I didn't need two, so off this one went. 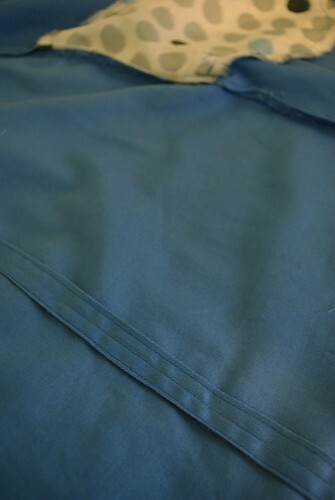 Construction: I added horsehair braid to the hem which was fun, but maybe made it a bit too costumey? Final Verdict: This is another go with your gut one. There's no reason not to like it , but because I don't, there's no reason to hang onto it either. Made/Age: December 2008, 7.5 years old. 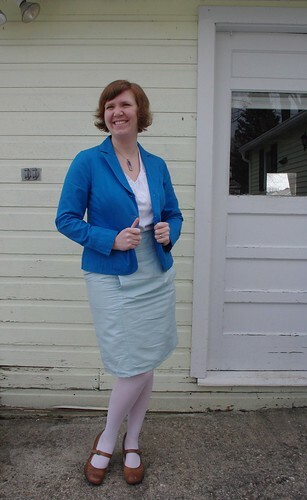 Fit: This one always falls under my pencil skirt sewing deficiency. It sits too low on the waist to be flattering. Style/Materials: Some vintage brocade. Fabric was beautiful, but I find it harder to wear lighter colored items on bottom. Also it has a kangaroo pock on the front, which makes it pooch out weirdly. Construction: I seem to recall it being quite well made, but it was early in my sewing career, so it probably was less so. 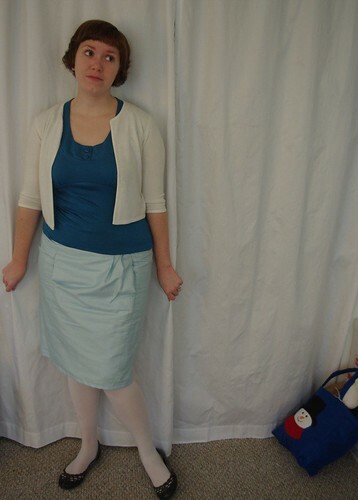 Final Verdict: I need to take a class on making a pencil skirt or something. 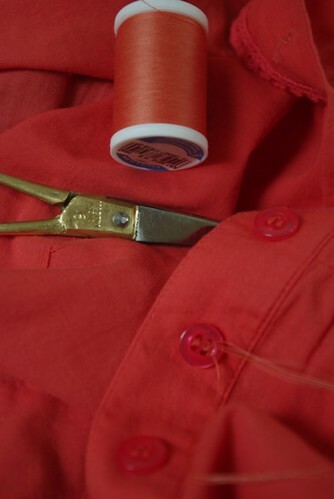 it is my sewing waterloo. 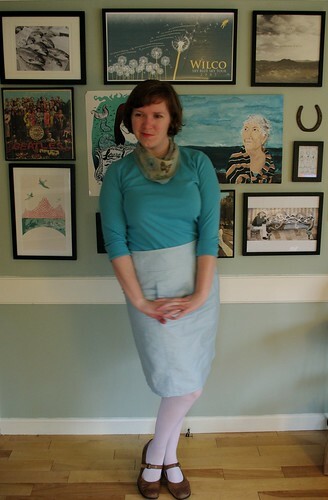 Fit: To finish up, the bottom dress in that pile is actually one my mother made for me in high school. The photo on the left is from 2004 and may be one of the last times I wore it (for my original Ms. Cleaver portrait at that!) . The dress is actually pretty flattering on, but is generally impossible to wear due to the narrowness of the front skirt panel. One stiff breeze and you have an embarrassing situation on your hands. Also, the quilting cotton print made it look like it belonged on a preschool teacher. Final Verdict: If you can't wear something without fear of repeatedly exposing your underwear, you probably shouldn't wear it. One of my favorite things about the new house is the absurdly large number of birds that live in the trees in our yard. I've spotted chickadees, tufted titmice, blue jays, cardinals, hawks, grackles (I think), woodpeckers and more. 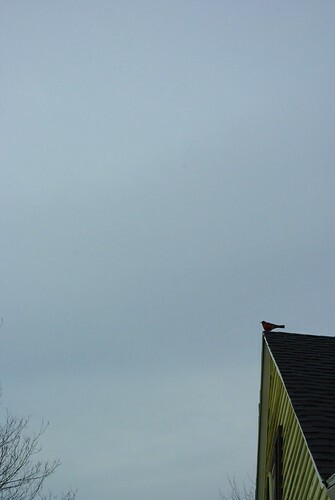 This morning I spotted my first robin. Quite fitting for the first day of spring (and more fitting than the current snowfall). For today's outfit I pulled out an old sewing project. 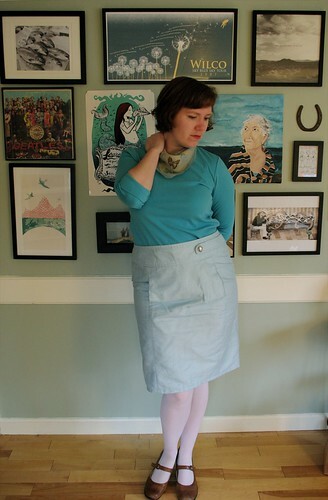 I had this skirt in the "to mend" pile, but don't remember what needed mending. It might have been that I wanted to hem it differently. I was pleased to discover I had done a really good job lining and finishing this skirt - despite having made it a long time ago (over 2 years!! ), before I had started focusing on finishing. In other news, my Krona knitting patterns were featured today on the Quince & Co. Website. Much thanks to Pam for including me! !